Los Angeles is a city that I can't quite figure out how I feel about. In my mind, it's incredibly glamorous, with movie stars and palm trees and gorgeous views. In reality, it's strip malls, being stuck on the freeway, and maybe that's the actress from Days of Our Lives? And yet, I keep going back, most recently because my boyfriend is a native and has friends and family there (the vast majority of whom are not in "the industry"). Of course, one of the benefits of traveling with an Angeleno is that they know how to avoid all of the crappy parts and take advantages of the good ones, the wisest of which being you should pick a side of the city (west side, east side, etc.) and just stay there. So this time we chose downtown, and I'm really happy we did, because I feel like my eyes were opened to an entirely new city altogether. DTLA has been a thing for several years now—remember Audrina looking at lofts on The Hills?—but what struck me most is how much rehabilitation is happening in the area. We saw so many old buildings being turned into apartments, restaurants, and hotels, which makes me so happy, because L.A. has a history of not exactly preserving its historic architecture. It all feels very urban and strangely not very L.A.-ish...except the weather is sunny and 75 degrees and perfect. All weekend long, I kept thinking I needed a jacket (San Francisco is ingrained in me! ), but even at night, I was comfy in this T-shirt. L.A. has an edginess to it (and a desire to expose some skin), so this was a good choice—and a nod to its designer, Anine Bing, who's based here. Speaking of exposing some skin, this skirt looks conservative but shows quite a bit of leg as you walk. It's best not to wear in windy weather, or at an event where you're going to be doing a lot of walking, but it's rather flattering, and red is pretty much the must-have color for fall. 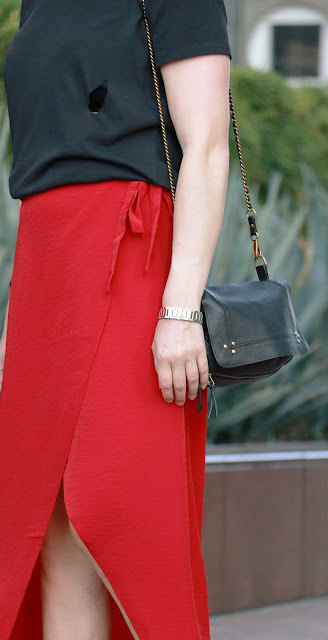 I've had this Jerome Dreyfuss bag for ages, and it's one of my favorites, as it works for day or night, and you can also clip the straps at the side so it doesn't hang so low. It's kind of like an edgier Chanel 2.55 bag. Hi Cheryl, I am Ada. So glad I found your blog through Shelbee's linkup today. You have such chic style. I have never been to LA though would love to. This elegant outfit has that easy, casual, beautiful LA vibe to it though. The tee and wrap maxi skirt are both so cute and I love the gorgeous shoes. I run a style linkup on Thursdays so welcome by and join me, dear!